In the projects-we-love file: Ariel Gordon’s TreeTalk in Winnipeg. The poet, who is currently artist-in-residence at the Tallest Poppy restaurant (a project organized by Synonym Art Consultation), conducted a tree-appreciation workshop and then invited the public to “write a short poem, message or secret” on a tag and attach it to the large elm right outside. Read the story in CBCNews Manitoba. Ariel Gordon is a Winnipeg writer. Both her books of poetry, Stowaways (2014) and Hump (2010) won the Lansdowne Prize for Poetry at the Manitoba Book Awards. She is currently working on two books, GUSH, a collection of literary work on menstruation for Calgary’s Frontenac House, edited with Tanis MacDonald and Rosanna Deerchild, and Treed, a book of creative non-fiction about Winnipeg’s urban forest for Hamilton’s Wolsak & Wynn. Other recent projects include curating the National Poetry Month in the Winnipeg Free Press project two years running. She stood there on the porch. That those years had not been easy. 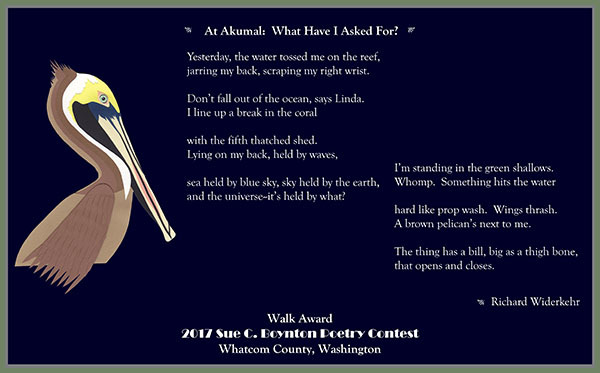 At age 85, I am one of the oldest poets in the Sue Boynton Poetry Contest. As an amateur poet I have been writing poetry since I was in grade school. Over the years, a number of my poems have been published in a poetry anthologies, school and college newsletters, and a some contests. My husband and I moved to Bellingham four years ago from Raleigh, North Carolina. Before I retired I was a teacher and social worker and from 1989 until 2001 I served as the executive director of a state advocacy organization for older adults in long term care. 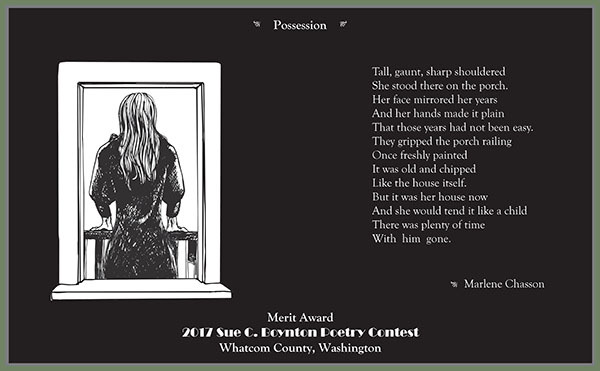 The poem “Possession” was written about my father’s stepmother. She raised my father and three of his brothers and was also the caretaker for his father when he became sick in his later years. *Copyright 2016 by Marlene Chasson. Broadside illustrated by Megan Carroll. In honor of John Ashbery’s 90th birthday, we offer this link to a 2008 edition of Rain Taxi Review of Books, which features “A DREAM OF THIS ROOM, A Created Spaces Portfolio of Works on John Ashbery’s Textual and Domestic Environments,” and a link to Karin Roffman’s brand new comprehensive biography of the early life of John Ashbery, The Songs We Know Best (Farrar, Straus and Giroux). If an autumn 2017 writing retreat or conference strikes your fancy, here are a number of events coming up in Cascadia and beyond. Australian poet and artist Richard Tipping makes artworks that incorporate his own poetic texts — cryptic, subversive, humorous, and often public. His “Signed Signs,” including Private Poetry, are road sign lookalikes. Fun. jarring my back, scraping my right wrist. Don’t fall out of the ocean, says Linda. with the fifth thatched shed. and the universe — it’s held by what? I’m standing in the green shallows. hard like prop wash. Wings thrash. A brown pelican’s next to me. *Copyright 2017 by Richard Widerkehr. Broadside illustrated by Kim Wulfestieg.